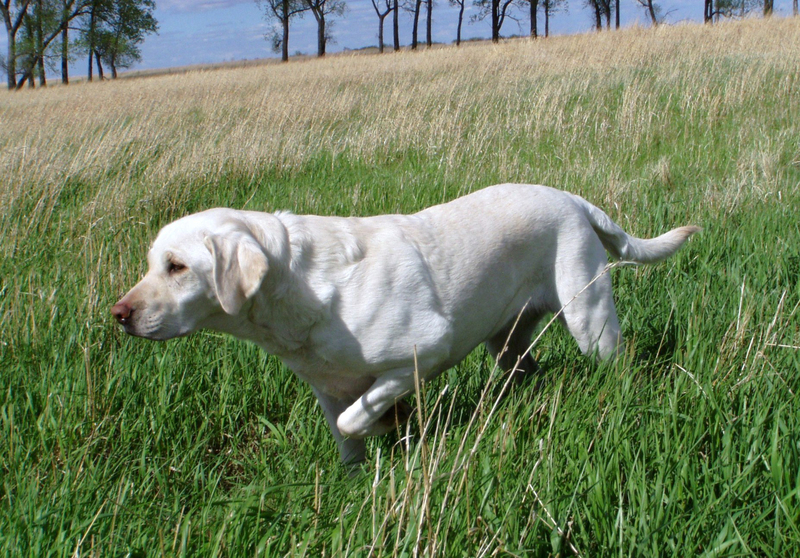 Belle truly performed as an all-around retriever at the elite level throughout all her competitions. She is the first and only dog in history ever to have achieved the level of titles she earned through all four of the North American retriever organizations: Grand Master Pointing Retriever, Grand Master Hunting Retriever Champion II (NAHRA), Hunting Retriever Champion & Upland Hunter (HRC), and Master Hunter(AKC). My dreams for Belle were to be a great hunting dog and participate in all the dog games I could find while being a family companion inside the house. The day we brought her home, she was unbelievably available to us as the 3rd pick out of a Raider/Brock female breeding. We couldn’t scoop her into our vehicle quickly enough! My friend Terry Holzinger asked me what I wanted to do with her, and I replied “Everything”. Boy, I had no idea what that would get us into! By the time Belle was 4 years old, we partnered in earning her CPR, MPR, and GMPR titles. Especially sweet was that she earned her MPR the same day her daughter Grace earned her CPR with me in Kansas. Belle had also been busy in the other dog venues participating most frequently in NAHRA tests. In 2008 she became the first dog in the Midwest to earn 1000 points at the highest testing level and was awarded the title of GMHRCH. She was named to the NAHRA Hunting Retriever Team six times, passing more than 50 Master tests. I had to caution other handlers and judges over the years that Belle was not “automatic”, even though that became the expectation while she passed over 90 tests of the nearly 100 tests we ran. Belle won and placed in many hunting tournaments in NATHA and NUCS across the country, often the same weekend as running in hunt tests. While performing at the highest level no matter the venue, Belle steadfastly reminded me that we were partners and dedicated her entire self to me as if we were married. Belle’s hunting days may be over now, but her heart and soul will forever remain strong in my mind along with all the memories.